This page is for the original 2009 version. For the 2019 GOTY Enhanced version, see Borderlands: Game of the Year Enhanced. Online component of retail disc copies is not functional as of September 15, 2014. 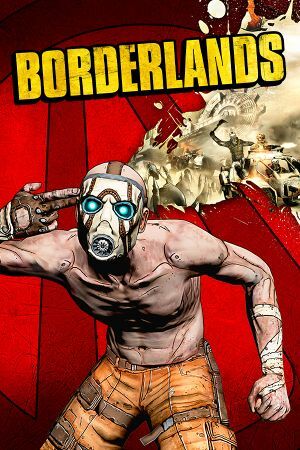 Retail owners who did not use the granting tool on Steam to convert their retail disc copies into a digital Steam copy before March 27, 2019 must purchase Borderlands: Game of the Year Enhanced to play online. Steam owners received all four DLCs for free for the original game following the release of Borderlands: Game of the Year Enhanced. Non-functional online mode following the shutdown of GameSpy. GOTY Edition. Five machines limit. GOTY Edition. Bundled with the GOTY Enhanced version. From September 15, 2014 and up until March 27, 2019 owners of retail disc copies could use a granting tool on Steam to convert their retail disc copies into a digital Steam copy, as part of a multiplayer service transition to Steamworks following the shutdown of GameSpy. This tool was disabled shortly before the announcement of Borderlands: Game of the Year Enhanced. Steam owners received all four DLCs for free following the release of Borderlands: Game of the Year Enhanced. Included in the Game of the Year Edition. Not to be confused with Borderlands: Game of the Year Enhanced released in 2019. Complete edition released October 12, 2010 which included the base game as well as the four DLCs. Also included Duke Nukem Forever First Access Club Code that granted early access to the demo of Duke Nukem Forever. While the granting tool only unlocked the base game on Steam, the included GOTY product key in the retail copy could be used to unlock the four DLCs. Delete or rename 2K_logo.bik, Gearbox_logo.bik, and NVidia.bik. Go to <path-to-game>\WillowGame\Splash\PC in the installation folder. Setting OneFrameThreadLag to False may cause a drop in performance. Vert-. See the WSGF report for Hor+. Toggle with Alt+↵ Enter or add -windowed parameter. See GeDoSaTo or Borderless Gaming. Capped at 62 FPS by default. See High frame rate. Run the tool and set your FOV in the middle-bottom section. You must set the FOV change to a key. Hit apply and close the hack. 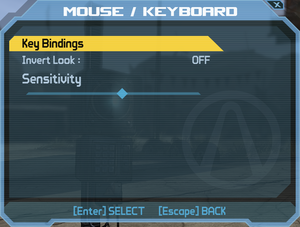 Then run Borderlands as normal and press your set FOV changing key. The FOV will "snap" to the Hor+ value. Using a vehicle or triggering a video in the game resets the FOV. Setting the FOV key to a movement key is recommended to instantly set the FOV again. Find under [Engine.PlayerInput] the section: Bindings=(Name="F8",Command="shot"). Add the following: Bindings=(Name="F11",Command="FOV 90",Control=False,Shift=False,Alt=False). 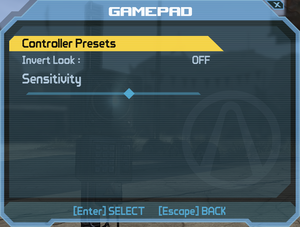 Use the Borderlands Config Tool. Force AA through the graphics control panel. Force AA through a third party utility such as nHancer for Nvidia-cards or RadeonPro for AMD. This may cause large performance drops. Use an FXAA-injector such as this one. Change bSmoothFrameRate=TRUE to bSmoothFrameRate=FALSE or change MaxSmoothedFramerate=62 to your choosing. Setting the frame rate too high can adversely affect physics. Left stick axes reversed on generic controllers. 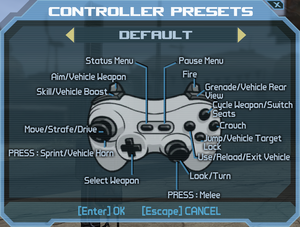 See Enable Xbox 360/PlayStation 3 controller UI. Search for all instances of InputKeyName="MouseScrollUp",ModifierKeyFlags=42 and change them to InputKeyName="MouseScrollUp". Search for all instances of InputKeyName="MouseScrollDown",ModifierKeyFlags=42 and change them to InputKeyName="MouseScrollDown". If this fix works, the "Online Game" and "LAN Game" main menu options will change to "Xbox LIVE" and "System Link." The loading tips and training tooltips will still show keyboard bindings. Music, SFX, and microphone volume. Auto configures up to 7.1 output. A Polish patch made by distributor is available here. Note that this patch requires at least game version 1.41, and DLCs are not included. Official localization by 1C-Softclub retail only. Fan translation by «Dimon485 / TTL T.Community». See this Steam Users' Forums Guide on hacking splitscreen into the game. 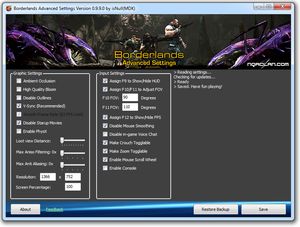 Original retail version used GameSpy, but was migrated over to Steamworks on September 15, 2014. Retail owners who did not use the granting tool on Steam to convert their retail disc copies into a digital Steam copy before March 27, 2019 must purchase Borderlands: Game of the Year Enhanced to play online. Add the target IP and port as a command line argument. See Helix Mod: Borderlands 1. This section details the necessary procedure and workarounds required to install a retail disc-based copy of the game on modern machines. Note that online will not be functional unless using a LAN/VPN-based workaround (e.g. Hamachi) to create a virtual LAN over the Internet with those you intend to play with. Ensure that the retail disc is available and ready, and that the game is not currently installed on the computer. Use the instructions for the Manual Release Date Check tool to generate a proper activation license for the computer. Now insert the retail disc and go through the installation as usual. The game should be fully playable after the installation has been completed, given that the disc is legit and is inserted in the disc reader when launching the game. To update the game to the latest available patch for retail versions, use the Borderlands Worldwide Patch v1.4.1. If the activation license had not been generated beforehand the installation process would fail after all files and folders had been copied over, when SecuROM DFA DRM tries to perform an online-based check that the release date of the game have passed. Instead of failing on that step, however, the process will just skip it entirely as a valid activation license already exists on the computer. GOTY owners might want to check out the WaybackMachine archived SecuROM support page for instructions (at the bottom) on how to activate the DLCs manually. Some users are experiencing a General Protection Fault, followed by an R6025 runtime error. One fix is to run Windows Update and install the KB2600217 update also found here. Find UseVsync and set it to True (helps with tearing). Another known issue has been with the inclusion of Dynamic Shadows, for some users having this graphical setting turned on causes huge drops in frame rate, no matter the specs of the computer. 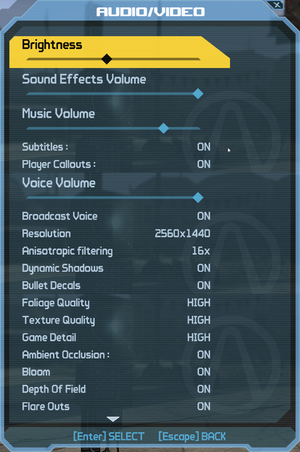 Turning off this setting can greatly improve performance. Add -nohomedir to the command line arguments; this is less than ideal as it will start you over from the beginning as it causes the game to create a new save folder. This fix worked for some people, is to ensure that your SaveData folder (located in %USERPROFILE%\Documents\My Games\Borderlands\) and all its contents are NOT set to Hidden and/or Read Only. The default font size allows for only 4 lines of stats to be visible, while weapons can have up to 5 stats. Locate your Borderlands installation folder. Find gd_globals.INT and create a backup copy. Open gd_globals.INT with a text editor. The problem lies with the grass rendering inside the Prison and affects no other part of the game. Find WillowEngine.ini and create a backup copy. Do not alter Foliage Quality within the game settings as that will reset the edit. However, as this problem only affects Lockdown Palace, it is fine to allow it to reset for any game session that you don't plan to go to that zone. Some laptop users struggle to make the game sound through headphones when they have laptops with built in microphones. Go to the sound options (Control Panel/Sound and Hardware/Sound) go into the recording tab and disable Microphone Array. Some users, after having installed and successfully played the game on Windows XP, experience a standard "Borderlands has encountered an error and needs to close" message after some time. There are no known solutions for this problem. GameSpy, Steamworks Original retail version used GameSpy, but was migrated over to Steamworks on September 15, 2014. Retail owners who did not use the granting tool on Steam to convert their retail disc copies into a digital Steam copy before March 27, 2019 must purchase Borderlands: Game of the Year Enhanced to play online. 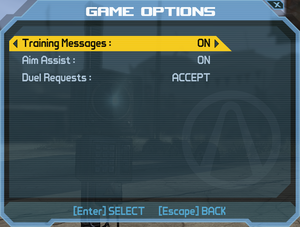 Borderlands Config Tool unlocks a number of settings not available in the in-game menu. 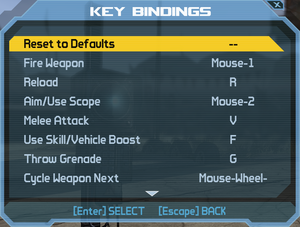 Run the game and change a keybind in the options menu at least once before using this tool. This will create the necessary .ini files and should fix options being disabled in the tool. This method disables the unskippable video sequence that plays every time you create a new character. Delete or rename Prelude.bik, Attract.bik, and VoG_Transition_Movie.bik. ↑ Automatic release date check service for retail discs of the original Borderlands seems down, but using the manual activation website (leave serial number field empty) along with the manual release date check tool should work. Note that this must be performed before you start the setup / installer of the game. See SecuROM support page for more information, although also note that the Borderlands-specific page does not work any longer, so the generic page (leave serial number field empty) must be used instead. ↑ GOTY DLCs might require manual activation. See SecuROM support page (at the bottom) for more information and instructions. ↑ 3.0 3.1 File/folder structure within this directory reflects the path(s) listed for Windows and/or Steam game data (use Wine regedit to access Windows registry paths). Games with Steam Cloud support may store data in ~/.steam/steam/userdata/<user-id>/8980/ in addition to or instead of this directory. The app ID (8980) may differ in some cases. Treat backslashes as forward slashes. See the glossary page for details. "ALL DLC: Didn’t own any Borderlands DLC? Now you got it all! On BOTH the original game and in Borderlands: Game of the Year Enhanced!" Confirmed worked for me on Windows 10 v1803 today. Verified with original disc-based copy from 2009 (non-GOTY version) on Windows 10 v1803 these last few days. This page was last edited on 6 April 2019, at 19:07.